The site-specific video installations of Sara Hornbacher and Monika Weiss have the like effect of altering perceptions of time and space while creating very different sensorial experiences. Both suspend ideas in temporality, and both work in multiple mediums to communicate complex concepts. Hornbacher's primary focus over the past 23 years has been the development of a series of video works on a variety of scales. “Altered States” is a cool, cerebral environment. Occupying a room by itself at Fay Gold gallery, the luminous installation consists of a 12 by 14 foot wall projection, a viewing bench and pre-recorded acoustic sound. The video is a loop composed of a 17-minute monochromatic visual template duplicated in green, red, blue and yellow/orange. Hornbacher manipulates found and filmed footage to alter time, shifting its real tempo to a multi-leveled synthetic speed. The initial focus of Altered States is the slow motion view of a tree-filled landscape. Hornbacher's use of positive and negative imagery, close-ups, and reversing sequences intensifies the sensation of transmutation. Slowing the film and sampling from a long pan has the effect of deconstructing movement and objects. A window that opens onto the landscape sometimes frames the view of an open book with its pages fluttering and turning in the wind, recalling the multitude of otherworldly tomes in the Peter Greenaway film, Prospero's Books. The nostalgia of the book, a vessel holding layers of unread words and potential enlightenment opposes the emptiness of the glass jar also seen through this frame. Or is the jar a blank page holding the same opportunity for fulfillment? Hornbacher sporadically overlays the living landscape with faint translucent images like an eye that weeps one tear. The pacific melancholy of the pastoral scene segues intermittently to angst-ridden clips from Hitchcock, Dali, and Bergman films and recurring transformative figure from the film, “Altered States.” A sequence of the glowing, anguished interloper trying to get back to human form gives way to appropriated film footage of crystal patterns and atom smasher. In connecting dissonant and resonant images with slow-breathing earth, Hornbacher acknowledges the spectrum of technology and its potential to give and take life. Horbacher's collaborator, composer Neil Fried, created an abstract digital soundtrack that is integral to the work. His synthetics acoustic vocalize a universal lament, fusing seamlessly with this meditation on the technological displacement of body and nature. Altered States describes hoe the texture and shape of time and space may be transmuted; its abstract, hypnotic effect could be reproduced in any four-sided, white gallery space. The exhibition of Monika Weiss' “Koiman” was also an endless push/pull experience, though its very physical drama was tied to a specific setting. The temporal video-sound-object created by Polish artist Weiss was near toxic sensorial experience. 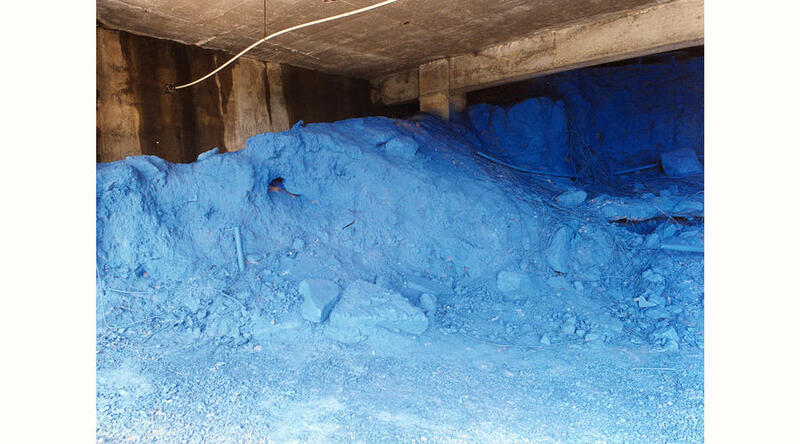 With the help of curator John Otte, Weiss installed wall-sized video projection, an 800 pound cast concrete baptismal font, 60 gallons of used motor oil, a mound of painted blue earth and prerecorded ambient train sounds in Space 1181. A Greek word meaning "to put to sleep, to put to coffin", “Koiman” became the antithesis of it is definition. Its crumbling, flowing, sucking, rumbling environment awakened, transfixed and unsettled the mind and senses. Dislocating boundaries of time, space and gender, this project was set in dark room. A river of murky brown oil emanated from the 35 by 35 inch octagonal font positioned mid-way through the space. The stream widened as it fell to the back wall, reflecting imagery from an adjacent projection. 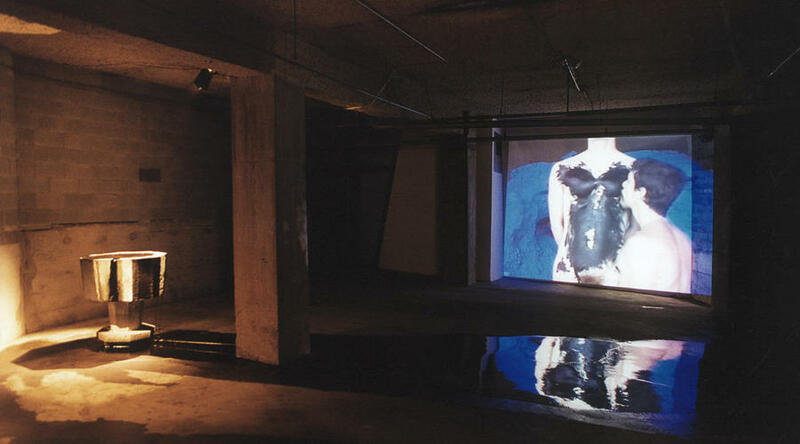 Oil fumes censed the head-on view of a 13-foot square projection depicting two figures engaged in an intimate ritual before a deep blue earthen wall. A kneeling figure suckled unceasing at the breast of a stoic "loved one." The subtle, paint-inflected hand of the artist entered the frame at rare moments to manipulate the actors. As a complex parody of ritual, “Koiman” revealed the cultural, social and political practices that engender decay and collapse. Private was made public, sacred became profane. Font mimicked holy vessel. Theatrical makeup pretended to be oil; oil feigned blood, holy water excrement. Sensual figures posed as Christ and worshipper. Obsessions, universally shared and damaging, were masked and unmasked. Weiss, who showed the wall installation “Saint Sebastian from Atlanta” at Nexus Press in Atlanta in 1996, consistently merges concept and environment in temporal multi-sensory installations. While an earthy, abject setting was critical to the realization of “Koiman”'s obtuse theatre, the replication of “Altered States” is dependent on a universe reduced to white cube.